In an uncertain world, school safety is becoming a priority. When Durango School District 9-R students returned to school Tuesday, some of them found locks and buzzers on school doors – with more security measures to come. “We hope parents will understand that their child’s safety is well worth the small inconvenience,” said Dan Snowberger, superintendent of District 9-R. The process began with school walk-throughs at all 11 schools in the district, said Kathy Morris, the safety coordinator for the San Juan Board of Cooperative Services. In October, the schools will hold safety training for students. The largest security mechanism is the people in the building, she said. 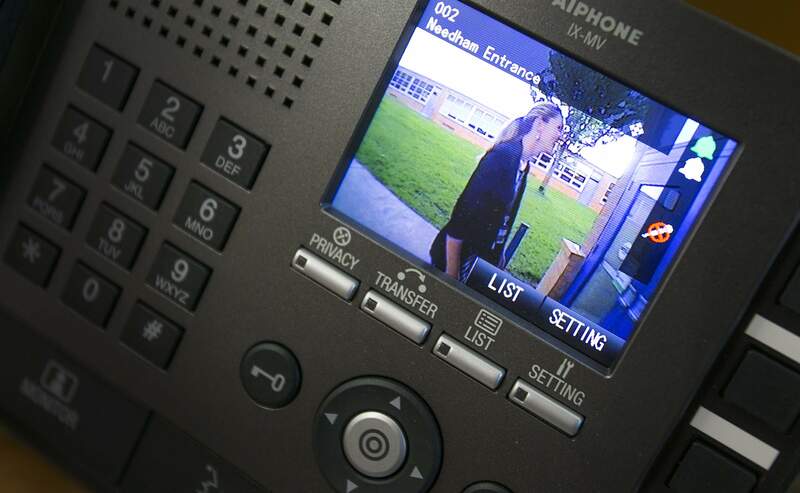 The buzzOne of the most significant changes for the 2016-2017 school year was installation of locks, buzzers and cameras on doors at Needham, Park and Riverview elementary schools. The four rural elementary schools – Florida Mesa, Sunnyside, Animas Valley and Fort Lewis Mesa – have had them for several years because law enforcement response times are longer for rural schools. “Right after Sandy Hook (a Connecticut elementary school where 20 children and six educators were killed in December 2012), we asked our schools to talk about safety with their families,” Snowberger said. “They voted to install the locks, and the parent-teacher organizations helped fund them. Our sense this year was that the time had come that every elementary school should be secured. Parents weren’t sure what to expect, 9-R spokeswoman Julie Popp said after the first day of school. There are many reasons students need security besides the much-publicized school-shooter scenario, Snowberger said, and elementary schools in Durango weren’t built with security in mind. Security departmentWorking with Morris, the district is increasing its security staff from three to five, adding one more to the staff of two at Durango High School and hiring another to staff Escalante Middle School. Miller Middle School already has a security officer. DHS also has a dedicated Durango Police Department officer, called a school resource officer, and Miller has a part-time school resource officer. The training took place the week of Aug. 15 at the DPD’s Three Springs substation, giving the security staff a connection to law enforcement and law enforcement a connection to them. The school security officers are not armed, Morris said. “They don’t have Tasers, handcuffs, a gun or a knife,” she said. That’s not really their function, Snowberger said. The school resource officers do have weapons. New Durango High Principal Jonathan Hoerl has talked to all staff members about handling both safety concerns and discipline in general. The cardIt’s a shame 9-R’s other safety initiative wasn’t ready for the first day of school because of unavailability of equipment, Snowberger said. Starting in October, students will have a card they scan when boarding or departing a school bus. Eventually, the card may become students’ access pass to other school activities, such as checking books out from the school library or handling their payment for breakfast or lunch, he said. Joan Ehat, who works in the office at Needham Elementary School, demonstrates the newly installed “buzz-in” video entry system now at all Durango School District 9-R elementary schools. The phone and monitor on Ehat’s desk allows her to see visitors that she can buzz in. She also has photos of people barred under protection orders from contacting students at the school that she should not buzz in. 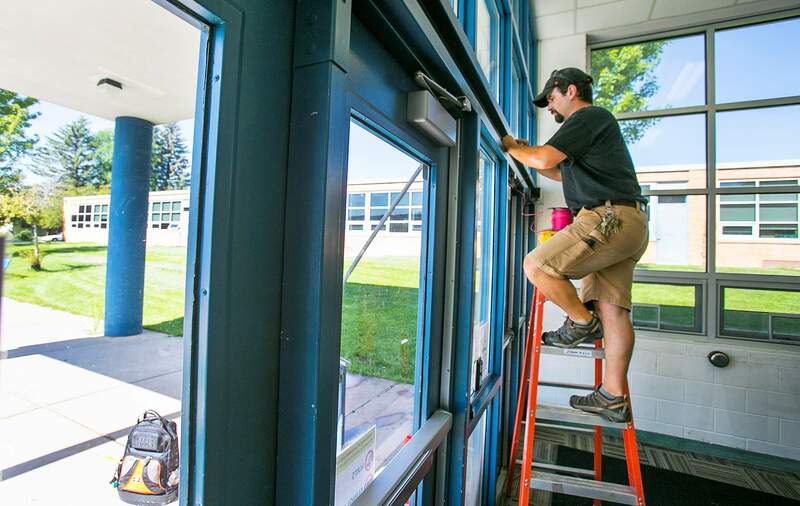 TJ Wilson, with Colorado State Safe and Lock from Colorado Springs, runs wiring through front doors at Needham Elementary School to prepare for the installation of buzz-in locking systems. The system was used for the first time Tuesday when students returned to school.